State-owned Pemex currently has six oil refineries in Mexico, which process around 1.05 million barrels/day (b/d) of crude. The company has now shelved plans to add a $10-billion refinery at Tula (Hidalgo) owing to doubts about its long-term viability. It does seem that it is unlikely to be needed since Mexico’s energy reforms have led to several private companies submitting proposals to build less expensive, modular “mini-refineries” in Mexico. Each of these mini-refineries is 80-90% smaller than any of the six giant Pemex refineries. 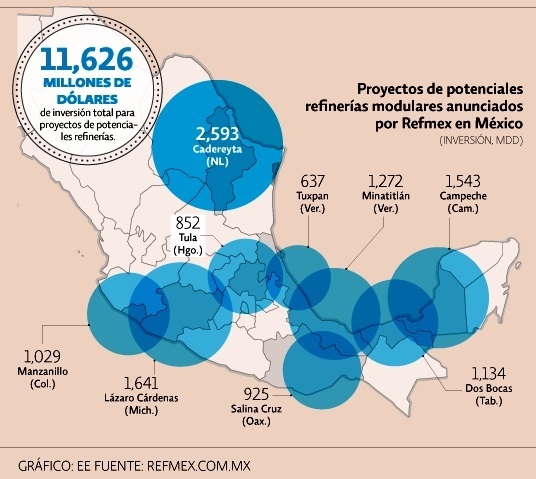 A consortium of U.S. firms, Refinerías Unidas de México (Refmex), plans to invest 11.6 billion dollars to build 9 mini-refineries, starting with a $1.5billion refinery in Campeche with the capacity to refine between 40,000 and 60,000 b/d. Construction would take between 18 and 30 months. Other proposed locations (map) include Cadereyta (Nuevo León), Dos Bocas (Tabasco), Minatitlán (Veracruz), Lázaro Cárdenas (Michoacán), Manzanillo (Colima), Salina Cruz (Oaxaca), Tula (Hidalgo) and Tuxpan (Veracruz). Several of these locations are in the recently announced federal Special Economic Zones, which offer fiscal incentives to investors.